...when beer ends up on her play menu. Heaven help us! Love this! This is something I would file away in a keepsake folder. Well, I guess over 21 is invited! 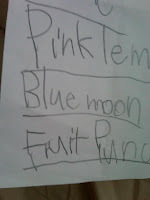 as long as the blue moon contains an orange, she's good, right? That's hilarious! The other day my son was in our fridge and he grabbed a beer and said, "This is Daddy's drink." Funny. Yes, it would surely show up on the play menus here too!!!! !